Super Bowl Sunday means big business for a lot of companies around the world. This year’s game brought in 111.9 million viewers. The average 30-second ad cost $5,000,000 on Fox. It’s a huge opportunity for the NFL itself, the two teams that play in the game, and any company that advertises during the game. There are plenty of business lessons to be learned from Super Bowl Sunday. It’s a day when millions and millions of dollars will be spent and earned. It’s a chance that companies plan for months in advance. The Super Bowl is the single biggest television event of the year, so it’s a chance that everyone involved needs to capitalize on. The top three business lessons to take note of from Super Bowl Sunday are to deliver quality, pick your partners carefully, and understand your ultimate business goal. Everyone submits ads that are the best they have to offer. The Super Bowl is a chance to get your brand in front of millions of new viewers. Super Bowl commercials are critiqued in the days after the game and have developed such a reputation some people tune in just for the ads. With such big opportunities available, companies need to bring their A-game. Whenever you create promotional material for your company, make sure that it conveys exactly what you want people to know about your company in less than 10 seconds. Be consistent in your branding and your message. Showing people how good you are in your advertising is what will bring them to you for work. Even if you’re not getting a Super Bowl ad for your company, you need to deliver quality. Create content and products that will get people talking about how amazing they are. Delivering quality work is a great way to generate buzz around your company. Work with people you want to be associated with. Everyone who appears at the Super Bowl is associated with the NFL and the Super Bowl brand. If I’m on the Super Bowl halftime show committee, who do I want to work with? I want people who can match what I can offer. I want someone who is professional, exceptional, and can enhance my own brand. Lady Gaga is an icon. She has 21.6 million followers on Instagram, 65.1 million on Twitter, and her most recent album is her fourth to hit number one on the charts. Association with Lady Gaga is great for the Super Bowl. Most especially as she opens them up to an audience that football doesn’t normally cater to. Lady Gaga also shows growth for a brand that has struggled with its image surrounding domestic abuse, homophobia, and assault. Lady Gaga has been outspoken about surviving her own sexual assault and has been an active supporter of gay rights for years. By selecting someone with that record of activism, the Super Bowl aligns itself with her beliefs. Choose the people that you partner with carefully. Make sure that you can offer each other value, and that they stand for things that you will also stand by. Work with people that will scale you up, not weigh you down. This lesson comes courtesy of the super bowl winners, the New England Patriots. The Patriots went into this game with a lot on their shoulders. It was the franchise’s ninth Super Bowl appearance, and quarterback Tom Brady was trying to bring home his fifth Super Bowl ring. The Patriots were focused on winning. That was their goal. In a game where they didn’t score until the second half, and only clinched the win in overtime, they had to stay focused on their goal. No retreat and no surrender. Know what you want from big opportunities that come your way. If you have a long-term plan in place for how you want your business to grow, you’ll be able to capitalize on any big chances. Stay focused throughout the opportunity in front of you and execute your plan to completion. Having goals for your business will keep you focused through the tough times. Goals will carry you through to the second half, which just might be your time to shine. Watching the two best football teams compete on the biggest television platforms in the US teaches us a lot about how business can be done. It’s the place to see and be seen on television. For companies who are advertising themselves, teams who are playing, and the NFL as an organization. The Super Bowl teaches us that delivering quality work, picking your partners carefully, and understanding your long term business goal is the way to handle huge opportunities. 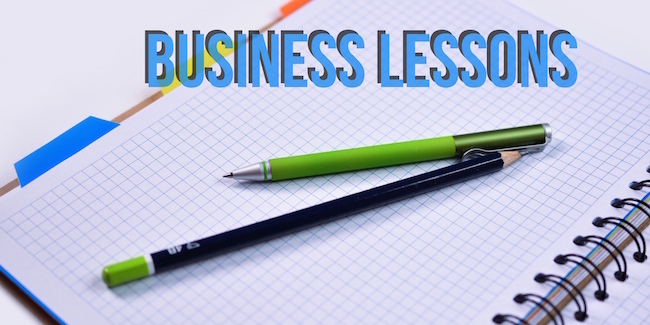 Take these three business lessons and apply them to your own work.